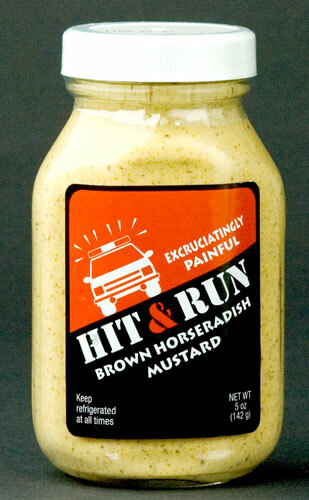 Hit & Run Excruciatingly Painful Horseradish Mustard has been MIA for the last several months but has returned with a vengeance. This sinus-busting horseradish mustard is downright nasty, in a good way. Fans of strong horseradish and mustard will appreciate the fiendish blend of fresh horseradish and spicy brown mustard. It’s superb on roast beef, in mashed potatoes, and in a Bloody Mary. Try one jar (HNR100), or blow away the neighborhood with a full case (HNR100X).